Mediterranean Diets are often considered amongst the most healthy in the world and have been found to significantly increase life expectancy. I’m thinking much of this could be due to the amount of labor involved in making a Mediterranean appetizer plate. 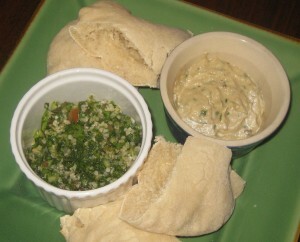 Seriously, to make 7 fresh pitas, baba ghanoush, tabouleh, and hummus took me about six hours. Who needs to go to the gym when you’re actively cooking for six hours? I’ve written about my endeavors in pita making, and for some reason, I just keep beating myself up trying recipe after recipe determined to make a better pita. This week was a Lebanese recipe, which I’ll write about in a couple of days. Anyway, save yourself the trouble and purchase your pitas. Or grab one of those bags of pita chips that seem to be jumping out from every grocery display these days. *Tangent* Did I tell you I drove my grocery cart into an entire display of Ragu Spaghetti Sauce the other day? Stellar driving on my part, and I didn’t even have the kids with me to blame. I swear that display came out of nowhere. There was glass and spaghetti sauce everywhere. Jars leaping from the display and crashing on to the floor in a time warped moment that seemed to last for years. Probably at least 15 of them. broken. on aisle 3. Ahem. Baba Ghanoush is an eggplant dip with an intimidating name, and a truly phenomenal flavor. For some reason, I always thought it was yogurt based which is just totally wrong. This dip is not that labor intensive, your active cooking time is maybe only 15-20 minutes? So you’ll still have to go to the gym to get your exercise. I seriously might start making this once a week, and can’t believe I haven’t been making it for years! If you’re making this for a party or for several servings, go ahead and buy as many eggplants as you can carry. You won’t regret it! It seems like they’re giant in the store, but your yield quantity after cooking is really quite low. A note of interest on the preparation, I accidentally failed to poke holes into one of my eggplants before roasting on the gas flame. I did poke the holes before I put it in the oven though. It could be a coincidence, but that eggplant cooked very differently than the others, and it was much more challenging to remove the seeds from the inside. They were swimming everywhere in the flesh versus the firmer version remaining intact in long strands for easy removal. So be sure to poke the holes in advance of any prep! Preheat the oven to 400. Use a fork to pierce several holes in each eggplant. Place the eggplant over the flame from the gas stove top, letting it rest directly on the grates. Turn every minute or two using tongs, until the skins surface is black and charred. Line a cookie sheet with aluminum foil, and roast eggplant in oven for 40 minutes. Let eggplant rest on counter for 10 minutes, then slice in half. Use a spoon to remove the strings of seeds, don’t kill yourself trying if you leave a few in the flesh. Scoop the remaining flesh from the skins and place in a blender. Add remaining ingredients, then pulse until combined. Stir to make sure the blade is free, then blend on low until you have a smooth consistency. Serve with pita bread or chips. I have yet to try to make pita, but I think I’ll do both those and this Baba ghanoush when I get the chance to go grocery shopping as it sounds oh so good! Thanks Janice, Glad you liked it! That’s a good question Laura! And I’m sorry for my delay in response. We’ve had a crazy holiday weekend. I’d say yes, peel off the skin with a paring knife or vegetable peeler, then blend with other ingredients. You’ll have more seeds, but since they’re edible, I’d guess it is more of an visual result than a taste result! Good Luck and thanks for visiting!